I got this recipe from a family friend years ago, and I had almost forgotten about it. So, when I found it again this week, I just had to make some. They're a sweet and gooey treat and perfect for when you don't want to heat up your kitchen by turning on the oven. 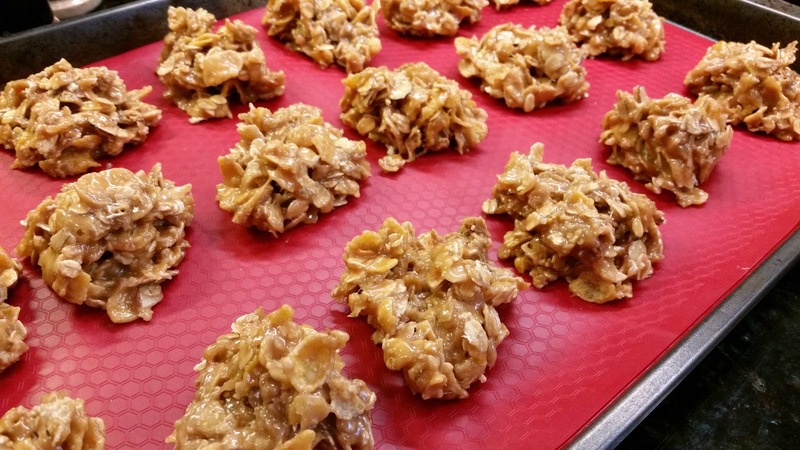 The original recipe uses corn flakes, but I didn't have any so I decided to use Honey Bunches of Oats w/ Almonds. I think they turned out great! These would probably be good with any kind of flake or mixed cereal that you like. Measure cereal and oats into large bowl. Combine sugar, corn syrup and peanut butter in saucepan. Bring to a boil and boil for 1 minute. Pour syrup over the corn flakes and oatmeal; Stir to combine. Drop by spoon onto greased cookie sheets (or silicon mat) to cool. Do not use waxed paper. The cookies will stick. Of course, on a hot day you will be tempted to store these in the refrigerator. That's fine, but you will want to bring them to room temperature before attempting to eat them. They will be a bit hard! Trust me, they're better when they're all ooey gooey and chewy.